If there’s one thing that terrifies me about getting married, it’s that there won’t be enough powder and contouring to make me look good in my photos. So it’s understandable that a bride got very upset when the photographer she hired called her ugly on Facebook. The Independent reports that Ashlea Howard was mortified after photographer Lee Maxwell Judd retaliated against the her complaint regarding photo delivery by posting horrible things about her on his professional page, probably knowing full well that Howard would see his comments. Judd claimed that the account had been hacked at first—although who would want to hack his account remains a mystery—and tried to distance himself from the post, even going so far as to apologize to those involved. As soon as people started criticizing him, however, he showed his true colors, responding to people’s comments with phrases such as “get back in your trailer” and stating that his critics lead “boring” and “miserable” lives. He also gloated about finally being “infamous” on his personal page, suggesting that his initial hacking defense (which no one believed anyway) was just a damage control tactic. 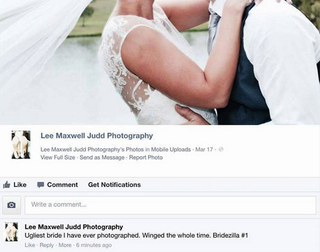 After all, how coincidental is it that a photo of a bride bearing the caption of “bridezilla” appears after the bride has a complaint about her photo delivery? No matter how you feel about your clients—and they can be supremely awful, it’s true—it’s never good business to go off on them on social media. And when weddings are concerned? Highly emotional events for which people have possibly paid the equivalent of a college education? Well, let’s just hope Judd has a backup career plan.